Australia had the pleasure of welcoming Hillary Rodham Clinton in Sydney this past week as she shared her insights and experiences of public life, an historical election and making an impact personally and professionally. 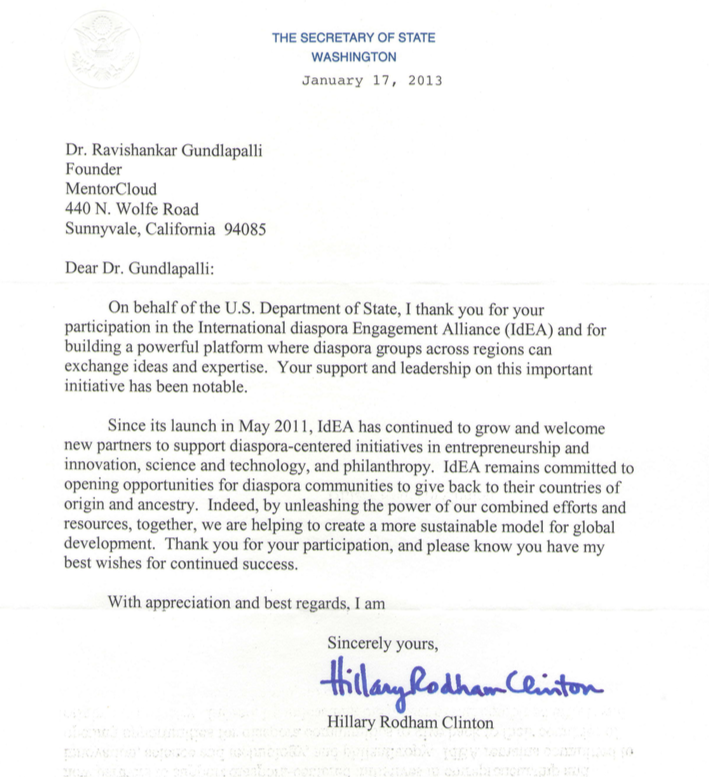 As a partner of MentorCloud, it gives us great pride that the Founder and CEO Dr. Ravishankar Gundlapalli was once invited by Mrs. Hillary Clinton, when she was United States Secretary of State, to deliver a keynote address on the power of mentoring for diaspora in the US. Being able to connect people across geographical borders is a unique function of the platform showing that regardless of distance, mentoring can be powerful any time and anywhere for empowering people with the wisdom they need to achieve their full potential. Here is an article Dr. Gundlapalli wrote soon after that great honour. See below Clinton's letter of acknowledgment to Dr. Ravi Gundlapalli. MentorCloud is a leading mentoring software platform, helping companies rapidly increase employee engagement, productivity and retention. Activate knowledge flow to enhance a culture of learning. Catalyse 'meaningful conversations' between inspirational leaders and aspiring employees to better attract, engage and retain top female talent. MentorCloud is trusted by prestigious global organisations that include, Young Presidents Organization (YPO), Entrepreneur Organization (EO), Marriott International, IESE Business School, Spain and Illinois State University College of Business. Interested in learning more about MentorCloud? Schedule a discovery call and demo here.